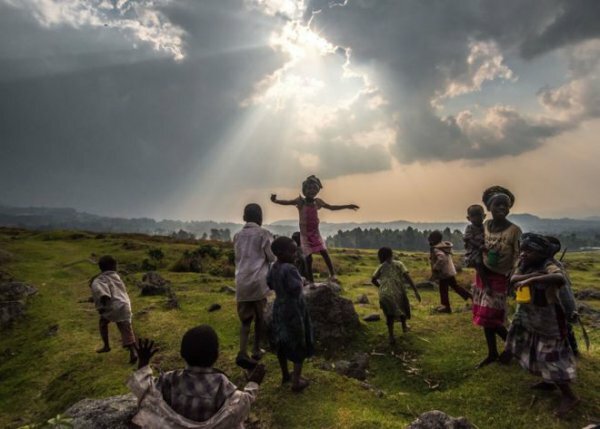 Swedish journalist and documentary filmmaker Anna Bohlmark recently released a documentary on the Batwa who have suffered mass displacement by the Ugandan government to make way for nature reserves. When the Bwindi forest became a world heritage site, the indigenous people who lived on the land for centuries was thus evicted to protect gorillas threatened with extinction. Nowadays, deprived of their ancestral livelihoods, the Batwa are often reduced to poverty and performing their culture for wealthy tourists. The next time you marvel at the mountain gorillas at the national park in Uganda, you would do well to do a bit of soul searching. Laudable as the efforts to preserve the gorillas from extinction are, not many know that the sight-seeing pleasures at the park came at a heavy human cost — the displacement of the Batwa pygmy people from their centuries-old habitat. The plight of these pygmies is the focus of a documentary by Swede journalist and documentary filmmaker Anna Bohlmark which is being screened at Unity Pavilion, Auroville at 3 p.m. on Friday. The film show will be followed by an interaction with Dr. Sehdevkumar, Professor Emeritus of Environmental Studies at the University of Waterloo, Canada, about pressures of modernisation on land. ‘Fog of Bwindi’ (25 minutes with English sub titles) is a 2015 documentary that tracks the plight of the Batwa (a pygmy tribe) who co-habited in harmony with the mountain gorillas in the Bwindi forest, south Western part of Uganda. In 1991, when the Bwindi forest became a world heritage, the pygmies were forcefully evacuated from the forest to leave space for the endangered gorillas. The mountain gorillas have become one of Africa´s biggest tourist attractions. But what happened to the Batwas? “This documentary gives a frightening insight in a society that places economic interests above all others including human dignity,” says Ms. Anna Bohlmark, who hails from Mora, Sweden. Ironically, while the gorilla population has almost tripled since 1991, the Batwas have been reduced to landless squatters, made to work on private farmlands, with hooch as prime wage for menfolk — a cycle of eternal exploitation. “The park is a money-spinner from a tourism perspective, but the Batwas are barred from their original home and are consigned to a life of penury and exploitation,” Ms. Anna said. The displacement from their habitat has turned many Batwas into alcoholics, she noted. “The Batwas can at best hope for some money when they are reduced to a spectacle for tourists by performing traditional dance,” she said.